Today's teens are searching for meaning and significance. . . help them find what they're looking for with THE BIBLE PROMISE BOOK FOR TEENS. God's Word is packed with life-changing verses - and this book arranges hundreds of them under topical headings that speak to the needs and concerns of young people of the twenty-first century. Featuring sections on Adversity, Discipline, Finances, Honesty, Labour, Obedience, Prayer, Purity, Relationships, Self-Control, Thought Life, Witnessing, Worship, and many more. THE BIBLE PROMISE BOOK FOR TEENS also includes thought- provoking quotations and friendly commentary that help put the wisdom of God's Word into a real-world context. - Publisher What does God's Word have to say about prayer, purity, relationships, self-control, witnessing, and worship? Now kids can find out---one attention-getting topic at a time! Blending topically arranged Bible verses with teen-friendly quotes and commentary, this resource makes a great gift for seekers, new Christians, and graduates ready to tackle the "real world"! - Publisher Packed with life-changing scripture arranged into topics that speak directly to young people and the world they live in. 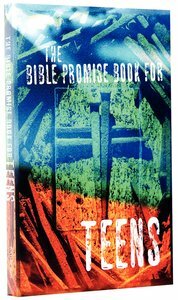 About "The Bible Promise Book For Teens"
What does God's Word have to say about prayer, purity, relationships, self-control, witnessing, and worship? Now kids can find out---one attention-getting topic at a time! Blending topically arranged Bible verses with teen-friendly quotes and commentary, this resource makes a great gift for seekers, new Christians, and graduates ready to tackle the "real world"! Packed with life-changing scripture arranged into topics that speak directly to young people and the world they live in.